Ladies! I know most have been waiting for this review and it has been highly requested since I posted it up on my haul more than a month ago. I am finally ready to review the Mia and I think I have tested it out well for the past month. I think the Mia is a fantastic cleansing tool. It has been part of my nighttime cleansing routine for the the past month and I even used it twice a day on the first week I got it. I eventually used it only at night or after I remove my makeup since using it twice a day really dries out the skin. Initial charging time for the Clarisonic Mia is 24 hours. Really long but it's okay, not a big deal. Regular charging time is 18 hours but it isn't that bad since the battery lasts for a good 2 weeks. The Clarisonic Mia that I have comes with a sensitive brush head which is really soft and gentle on the skin. It is not abrasive as most think it is. Some complains about the vibrating noise of the Mia but it is a lot quieter than my spin toothbrush. It is waterproof so it is great to use during shower time - this is actually my favorite feature of the Mia. According to the manual, the Mia should be used 20 seconds on the forehead, 10 for each cheek, and 20 on the nose and chin. It automatically shuts off at 60 seconds of use. While I think this is a nice way of not over cleaning your face I don't really mind this feature. Sometimes I even find it annoying that it shuts off automatically especially if I wanted to focus more on my chin area where I always get my occasional pimples. Plus, I do use the Mia on my decollete area so I do need more time for that. The Mia is amazing when it comes to cleaning the face. I used to just use my hands and cleanser to clean my face after removing my makeup but Mia cleans everything so thoroughly. I used to believe that my hands and cleanser can do the job removing all my makeup but I was wrong. When I first got my Mia I put it right to the test. I removed my full face of makeup, scrubbed my face using my hands and cleanser and rinsed with water. I then used the Mia and cleanser and to my surprise, foundation was still present on my face and transferred onto the brush head. After my first use of the Mia, I noticed a slight difference in my face, it appears much brighter. I felt thoroughly clean and fresh. So that settled it, Mia officially became my cleansing partner. I don't have bad acne, I have occasional breakouts especially when my hormones are on overdrive. I also didn't go through the purging phase which some had to go through. When I started using the Mia I had post acne hyperpigmentation on my chin which had developed only 4 days ago. It usually disappears after a really long 3-4weeks but when I started using the Mia it cleared in a little over a week. Though I can't really say that it made my skin flawless. For the past month that I used the Mia I still got my occasional pimples. I also have big pores and several whiteheads on my nose and that really bothers me. Other Mia reviews said that it minimizes pores, blackheads and whiteheads. I don't find this to be true as well since my pores and whiteheads are still present and does not look smaller or fewer than they were before. Though Mia is an exceptional cleansing tool, it also needs to be paired with products that works great with your skin and a really good facial routine. Even if I have an effective facial routine before I used Mia I think that they don't help showcase Mia's potential of clearing my skin problems like reduce the size and number of pores and white heads and improve my skin tone. I believe that if I find the right products to go with the Mia in my routine I would see a lot of improvement on my skin and affirm other review claims. Every person is different and of course, the products that worked well for one will not work for everyone. Those who claimed that Mia improved their skin tone, reduced pores, blackheads, whiteheads and cleared pimples are those who have found really good skincare product partners for their Mia. I am still looking for the right products to go with it and I think I'm on the right track. I'll give an update on the Mia and a skincare routine once I find my Holy Grail skincare items. Overall the Mia is quite a good investment for a clean, brighter and fresh skin. I must admit that on the first week I used it I wanted to ship it back since I didn't see the results I wanted but upon religiously using it, I changed my mind and thought that it was worth the price. I really enjoy using my Mia and after having it, I'm not going back to using just my hands on cleaning my face. I've been wanting to try this forever, but thought the price was a little steep. Now that you've done a review on this, I definitely want to buy it! :] btw, I love your blog! Great review! It was nice and detailed! A battery that lasts 2 weeks is really good! Thanks for being honest and saying that you are still working with the product to get your results! I really liked your review! Now you have me thinking I might just need one of these! I need to quit spending so much money tho maybe I'll put it on my birthday wishlist. Great!! It seems very interessant, I think I'm just being to need it! Thanks for the review! I enjoyed it!! Thank you for stopping by my blog! 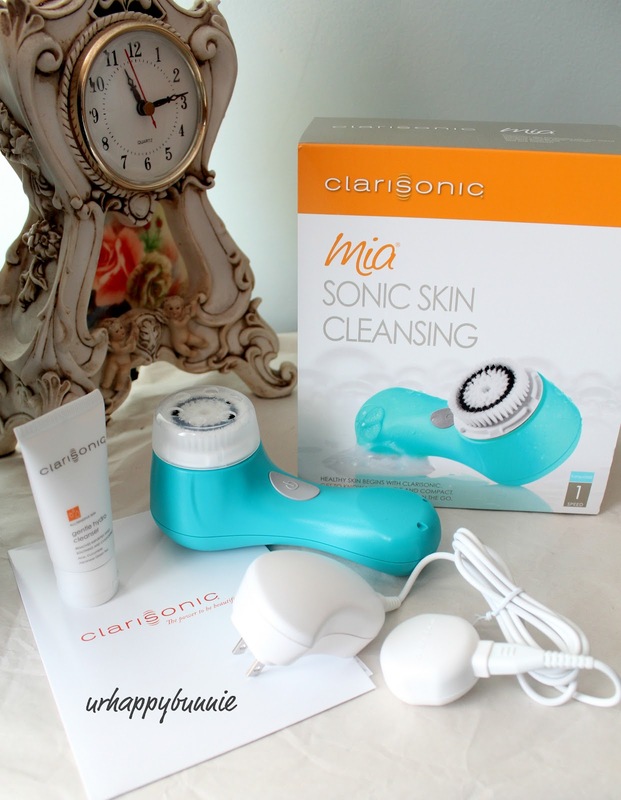 I love the Clarisonic and wondered how it compared to the Mia! Thanks for the review! BTW, came to your beautiful blog via bloghop couple weeks ago and followed you! Waiting for you for a visit:-)Thought to let you know so you could follow back! Hope you are having a wonderful day!